As world leaders in Warsaw focus on Russia’s “aggressive actions,” Europe’s real problems go unnoticed. Yet clearly not all aggression is equal in the eyes of the NATO alliance. Ukrainian President Petro Poroshenko, who was front and center on the summit’s opening day posing for the cameras alongside German Chancellor Angela Merkel and British Prime Minister David Cameron, has repeatedly fired indiscriminate Grad rockets on heavily populated civilian areas, a war crime under the Geneva Convention and International Criminal Court protocols. 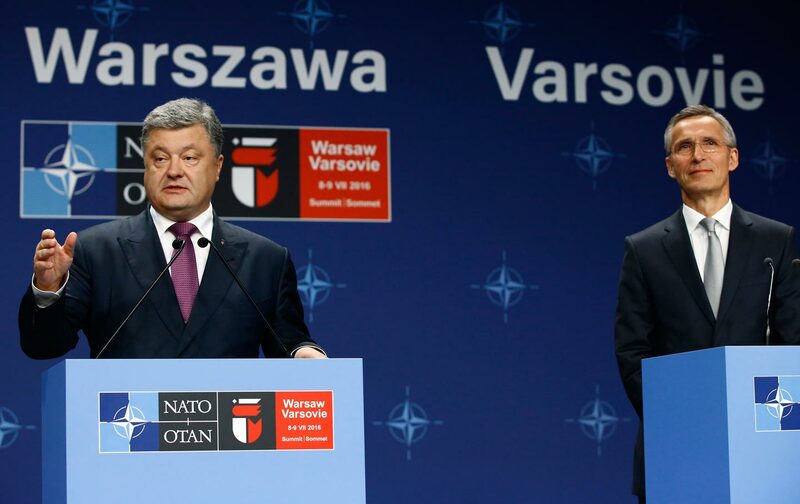 Nevertheless, the principal summit “deliverable” was aimed at placating Poroshenko and his vocal band of alliance supporters (particularly the United States, United Kingdom, Poland and the Baltics). The alliance pledged to station four battalions (or nearly 4,000 troops) on Russia’s western frontier, ostensibly to prevent further “Russian aggression” in the region. The Poles are pushing for the troops to be placed in the Suwalki Gap, on the border of Poland and Kaliningrad, a non-contiguous swath of Russian territory on the Baltic coast tucked in between Poland and Lithuania. Yet the troop buildup is based upon the faulty, though widely believed, premise that Russia’s assistance to the rebel forces in the breakaway republics of Luhansk and Donetsk is a prelude to even grander designs by the Kremlin. As the neo-Nazi Speaker of the Ukrainian Rada, Andriy Parubiy, told The Washington Post in February, Putin “will proceed, until he is stopped by force.” This idea, repeated ad nauseam by Ukrainian officials, is one without any basis in reality. Yet NATO member states, particularly those along Russia’s borders, have embraced Kiev’s rationale, the better to squeeze the alliance for as much money as possible. The problem, of course, is that Russia doesn’t even want the small slice of eastern Ukraine it currently helps control. No evidence suggests that Poland and the Baltic states are in Russia’s sights. Indeed, NATO is addressing a phantom problem of Russian revanchism rather than an actual one: Ukrainian civil war. What NATO heads of state ought to be doing is redoubling diplomatic efforts aimed at the full implementation of the Minsk accords, as well as fashioning a humanitarian aid package to assist those most affected by the war. Increasing NATO troop levels in Poland will neither put an end to the fighting nor help the millions of non-combatants most in need. Yet NATO persists in the delusion that Russia’s incursion into eastern Ukraine is the primary obstacle to a Europe “whole, free and at peace” while its own numerous maneuvers should be viewed as nothing if not benign. Already this year, NATO has undertaken military exercises in Georgia (March), Norway (March), Bulgaria (April), Estonia (May), Romania (May), and Poland (June). Ideally, summit meetings should be a time for truth-telling, and the truth is this: NATO has become an insuperable obstacle toward the formation of what Europe needs most: an inclusive security architecture that takes into the account the national-security interests of all parties on the continent, from Lisbon to Vladivostok. The alternative is a Europe riven by two powerful military blocs; but, unlike during the Cold War, when the division ran through central Europe, this divide runs along Russia’s western border. Considering NATO’s recent history of military interventions in Serbia (1999), Afghanistan (2001–present), and Libya (2011), Western leaders who race around proclaiming that NATO’s ever-eastward expansion shouldn’t be a problem for the Russians because NATO is merely a “defensive alliance” are being willfully and dangerously obtuse.